My inspiration for the Nightmare Tree itself comes from the Baobab, which can't actually be found in the Seychelles (the setting of the story), being a native of Africa. Its appearance suggested lust, greed, gluttony and every form of excess embodied in a single image. 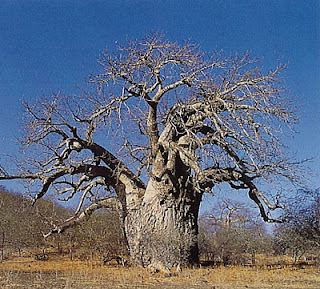 In addition, a myth concerning the origins of the Baobab tells of how "Nkulu-Nkulu" (the great Lord), when he was planting the first trees on earth, accidentally planted the Baobab upside down, so that its roots grew into the air. What a perfect symbol of the nature of evil!